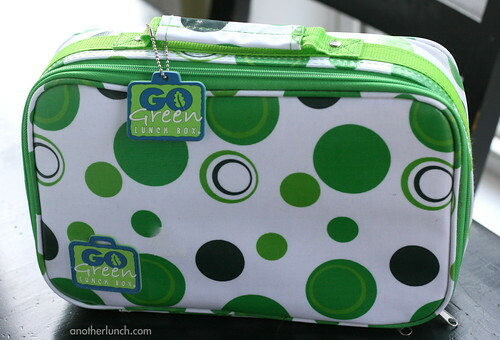 As I said at the end of yesterday's Yellow Day lunch post, we'd be going green today... and I meant that quite literally as I finally broke out our GoGreen Lunchbox. The bottle's "spout" part is shaped exactly like kids Sigg drink bottles we've had in the past. Kind of a little pop-up thingie (technical terms are my specialty). You push it down to close it, pop it up to drink. I opted not to use the drink bottle because in the past those Sigg bottles never stayed leak-proof for long because my kids bite and chew on the pop-up thingie which causes it to get all wonky (see what I mean?) and not able to close completely. That section is big enough to hold a variety of drink boxes (Horizon milk also fits in it), but not big enough to hold a Thermos FunTainer, my fave reusable bottle for lunches. Secondly, or maybe this should have been firstly, this box is big. I bought this lunchbox almost two years ago and this is the first time I've packed anything in it. I expected it to be the same size as a Laptop Lunches box, but it's quite a lot larger. 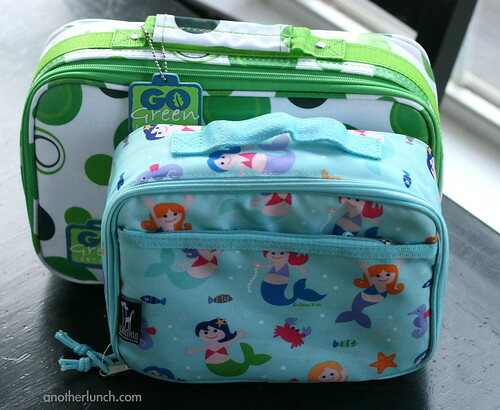 I didn't have time this morning to compare the GoGreen lunchbox beside a Laptop Lunches box, but I did snap a quick picture of it in the carrier next to a normal sized lunchbox. 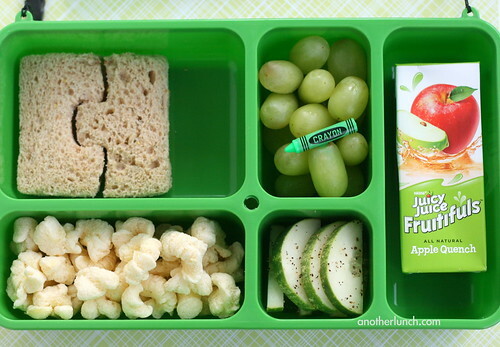 When Paige or Tyler use a Laptop Lunches box I pack them in their Olive Kids lunchboxes. The Laptop Lunches fits perfectly in these, snug but not too tight. Look at the difference is size between them! - it is a sturdy two-piece design. Bottom tray and a lid. That's it. HERE'S THE REALLY GREAT PART!!! ... each section seals completely leak-free. See, that lid has silicone gaskets on each little compartment. Think applesauce, yogurt, juicy pineapple, all staying nice and tidy right where it is supposed to be. Without the use of extra inner compartments or lids or Press n' Seal. That's like the lunch packer's holy grail. So that's the scoop on the new box. Obviously it hasn't met the test of time yet, unless you count the time it sat on my bedroom bookshelf buried under a pile of school artwork. It held up fantastically in that case. Next up: Blue Day. The excitement never ends. UPDATE!! - When I unpacked Paige's lunch after school I discovered that she had only drunk about half of the juice box. 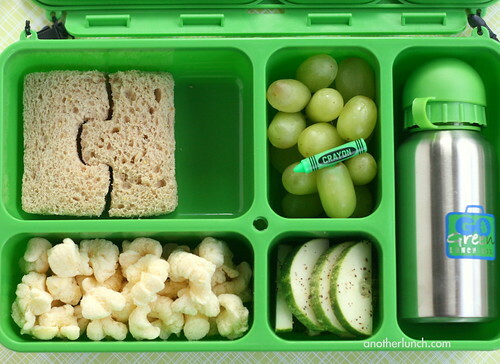 The little darling didn't want to "waste it", so she put it back in her bento box to bring home. Eek!! The section the juice box was in had about an inch of apple juice pooled in it. And it didn't leak out! I was shocked. Thank goodness she latched the whole box back together after eating!! The carry bag was a little wet on one side, but I'm pretty sure it was from condensation of the ice pack I had placed in the mesh pocket on the inside. Does a drink fit in the Olive Kids lunchbox with the laptop lunch? I have a laptop lunch but have never used it because I don't have a case for it. A drink box fits in the Olive Kids lunchbox when a Laptop Lunches is inside it. It's tight, depending on what kind of drink box it is (some are wider than others), but it works. Sometimes I'll leave out one of the inner containers of the Laptop Lunches box and just place a drink box in that space. Also, the Olive Kids lunchboxes have a flat zippered pocked on the outside and sometimes I'll just slip a drink box in there. You don't have a problem with the lids on your Funtainers breaking? 2 out of 3 of our broke the first time they were dropped lid-side down on the floor! Maybe we are just bad dropping people, but it's super annoying because they are otherwise the perfect water bottle. I've seen those crayon picks at my local Cake Supply store. With all your lunches this week, you definitely convinced me to go back and buy them! Wendy, the lid of our very first one did break soon after we got it. Owen was just a toddler and yanked the lid backwards too far and it snapped off. We still use it though - I just ordered a replacement lid for it. I think we've been using FunTainers for five years now and that was the only time we had a problem with one. I do think though that the newer lids are more forgiving that the old original ones. They seem to have a little more give in the hinge, I think that might be a good thing. And to be honest, even if I had to replace the whole FunTainer on a monthly basis I would do it. Owen used to *only* tolerate a Horizon milk box in his lunch. Those babies are $1 a piece, at a cost of about $25 a month! Last year we were able to "wean" him onto drinking regular milk in the FunTainer for school. Using the FunTainer with him is extremely more cost effective! The love the color themed lunches.